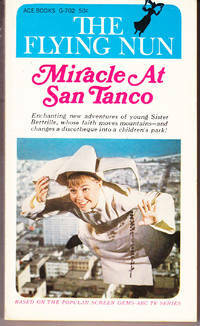 The Flying Nun: Miracle At San Tanco. Paperback. Ace G-702. 1968. TV Tie-In. Small scuff on cover, otherwise VG.. Ace 1968 Paperback CONDITION: good. New York (1968): Ace Books VG, Edgewear, crease, soiling, browning/NO DUST JACKET. "Based on the popular Screen Gems-ABC TV series". Ace G-702. Expanded condition report/scan on request.. Edition Not Stated. Mass Market Paperback. ACE. Very Good-. 1969. (Film/TV tie-in). Paperback. (minor edge wear) [THE LITTLEST REBELS] (covers have stills and ABC-TV series ref. ) [US pb. ] . ACE. Very Good. 1968. (Film/TV tie-in). Paperback. (minor edge wear) [MIRACLE AT SAN TANCO] (covers have stills and ABC-TV series ref. ) [US pb. ] .